Another year down and another great conference complete. The last week running up to the conference date is always full of last-minute issues and problems that need solving. Spending my Thursday evening at Staples, photocopying hard copies of the session agenda is just one example. Overall, the event was a big success, thanks in large part to the work of Persis Hui and her incredibly hard-working group of volunteers at David Thompson. 475 registered attendees with 50 walk-ins led to a full house of satisfied participants. Keynote speaker Jason Ohler shared his vision for a connected future and inspired many attendees throughout his two breakout sessions. The afternoon saw the cafeteria quickly fill up with eager attendees, hoping for their ticket drawn for a door prize. We had 11 iPads to give away in addition to several other valuable prizes donated from our sponsors. 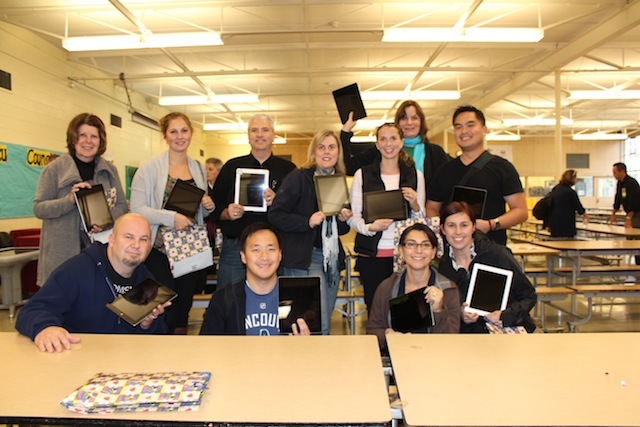 Big congratulations to the 11 iPad winners and an even bigger thank you to everyone that came out to engage, share, participate, present, and discuss. It was a tremendous day for all.